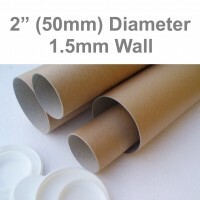 A1 Postal Tubes for protecting your A1 Posters, Documents, Maps, Decals whilst in the post. We offer A1 postal tubes in various diameters & even wall thicknesses. The most usual size tube used for A1 mailing is our 25” Long x 2” Diameter. The Metric size of this tube is 635mm x 50mm Diameter and it has a 1.5mm wall. Because customers often require either additional wall thicknesses, diameters or longer tubes to accommodate items other than A1 size documents, we also offer them in 38mm diameters, 3” 76mm diameters and 100mm 4” diameters. Hopefully you will find this specific A1 page helpful in identifying a suitable A1 size mailing tube, but you may also like to check out our main round cardboard postal tubes page for other options. We also offer triangular postal tubes in various lengths. We offer the cheapest prices on top quality A1 sized postal tubes with FREE DELIVERY to nearly all UK addresses. 1.5” Diameter Postal Tubes 25” Long - 635mm Long x 38mm Diameter﻿Good quality narrow diameter A1 Pos..
A1 Postal Tubes 25” Long x 2" Diameter - 635mm Long x 50mm Diameter﻿Need to buy strong ..
3” Diameter A1 Postal Tubes 25” Long - 635mm Long x 76mm Diameter﻿Strong cardboard Postal Tubes 6..